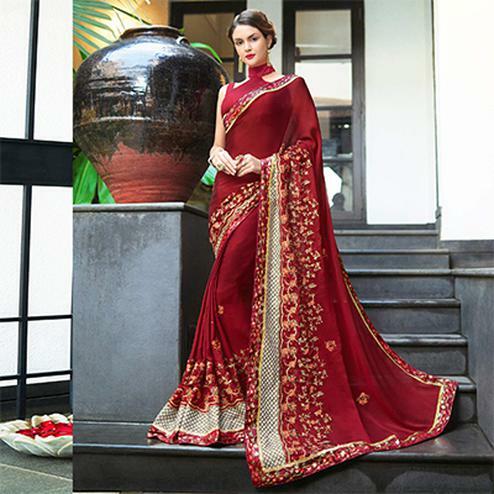 Be a glamorous star in this stylish designer maroon saree. This ethnic piece is showing some amazing work done with lace border which makes this saree look sober & impressive. Accompanied with banglori silk fabric unstitched blouse piece which can be stitched as per your requirement and add more grace to this beautiful saree. It is must to have in your ethnic closet. This attractive color saree would surely attract you showers of compliments when you wear it for parties functions or occasions. Team it with classy accessories to make your looks more beautiful. Buy this saree now as it's a unique piece with attractive color which is rare to find.